I've learned a lot about running - and training to run - in the past 2.5 years. Most of all, I've learned how important it is to tailor a training schedule to your individual needs because every runner is different. For my first half marathon, the San Francisco 1st Half Marathon in July 2009, I followed a training plan found on marathonrookie.com. It looks like this. This plan was pretty simple to follow, focusing on the number of miles for each run and four runs per week. My husband and I trained together, and I kept track of our progress in a Google Spreadsheet. We followed the plan about 90%, taking an extra day off here and there for fun events like a Green Day concert and a little biking to give our running muscles a rest. I'd already trained for and run my first 10K that May and Kevin is a long time runner, so we weren't starting from scratch with the half marathon program. I'm very glad I had even a little bit of running experience prior to starting half marathon training. 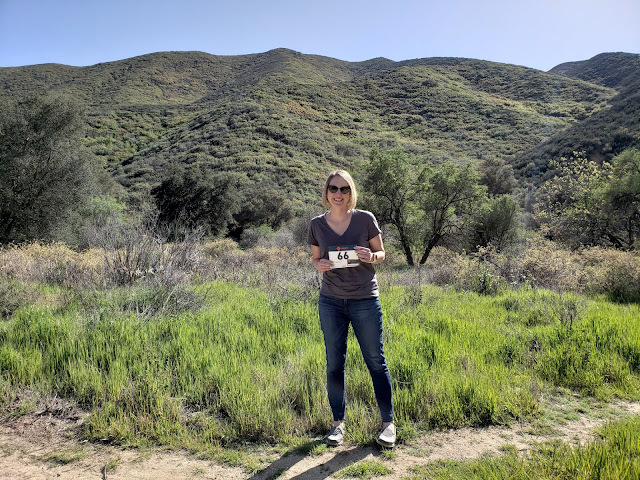 Having some mileage under my belt before training for the half gave me more confidence in my ability to prepare for and to finish an event, and of course it's what triggered my interest in running a half too. In addition to the 10K at the end of May 2009, I had run two 5K races in February and April of that year. I'd started running regularly at the end of 2008 to train for a Mt. Hood climb; little did I know I'd stick with it! During the training period for the 10K and then the SF Half, I felt good overall but significantly challenged. I wouldn't say I'd found my rhythm yet, and the majority of my training runs felt hard. I often found myself fighting shin splints, an issue that would recur in the future. We had a couple of super hot and humid long runs that summer in Michigan that felt like they'd never end but training with Kevin helped a ton - he kept me going when I began to doubt my ability to keep going. I had a little trouble with an old college knee injury to my left knee (yes, the same one I'm dealing with now) and wore a brace for the duration of training. I'd had physical therapy a few years before but not around the time I began running regularly, and I was wearing the brace given to my by that therapist. I later discovered that strength training was key to running and got rid of the brace for good. When race day came, I was very nervous but managed to be well fed and well rested despite the early start time. We estimated our finish time as 2 hours 45 minutes, so we started with wave 7 out of 8. The run turned out to be great; the course is fantastic and fairly hilly. By the time we went over the Golden Gate Bridge and back we were at mile 9.5 and practically done. I didn't walk at all and kept a slow but steady pace, finishing in 2:31:45 and beating our estimated time. I remember how good it felt to cross the finish line, my leg muscles tired but not completely wiped out. I was immediately addicted to half marathons and couldn't wait to sign up for another one, which ended up being Detroit. 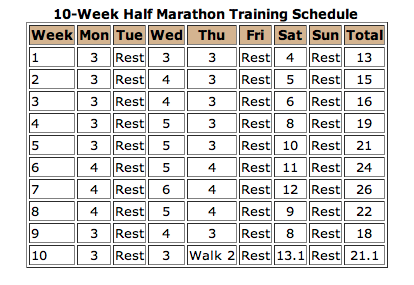 As for training plans, I continued to use this one for the Detroit Half Marathon in October 2009, going down in mileage a bit and rebuilding to give my body a rest. The training plan gave me a jumping off point, and I found running four days per week to work well for my body. I supplemented the schedule with strength and elliptical workouts as well as rest days. Looking back on the Marathon Rookie plan, it helped train me to finish a race but was missing guidance around how to improve my ability to run faster and more comfortably. The weekly mileage is low, we averaged 20-22 miles per week. For our next races in 2010 we tried a more complicated training plan to work on speed and pace.